Sama-sama Sa Lund is inviting our members and friends to attend our first event of the year, Sama-sama Sa Love (“Together in Love”) Valentine’s Party 2016. There is no entrance fee, but it’s a potluck party so guests are asked to bring food or drink to share. Also, to celebrate the Valentine’s spirit, we encourage guests to wear red and bring a date! 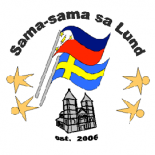 This entry was posted on January 31, 2016 by Sama-sama Sa Lund in Events.